Retro Noble Kitty theme is the best beautifultheme in the world. 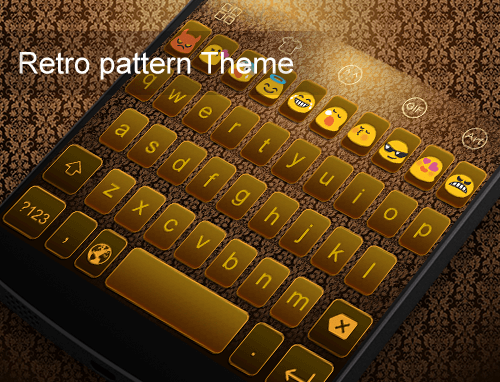 Retro Noble Kitty Theme make your keyboardbeautiful and make your life colorful. Retro Noble Kitty Theme makeyour friend admire and be jealous. KITTY EMOJI GIF Keyboard chatting Emoji-Gif is one smartkeyboard app for android devices that makes typing fast, easy andfun. It saves your memory space, makes your keyboard use smooth andfunny. KITTY EMOJI GIF KEYBOARD armed Emoji,Emoticons and Smileys andother cool symbols now include many useful, common, and interestingsymbols, and will update for more symbols. You can use directlyinsert it into SMS, whatsapp，facebook，twitter and other social networking. KITTY EMOJI GIF KEYBOARD make your keyboard owned sensitivehand, mobile face, intelligent eyes, finely made bodies and otherall kinds of expressive emoji symbols to chat with your friends andfamily. After downloading the KITTY EMOJI-GIF KEYBOARD, you will besurprised to find Emoji Keyboard is just what you want. KITTY EMOJI GIF KEYBOARD is free of charge and advertisement,supporting the input of Emoji, Emoticons and Gifs animation. It isintelligent, interesting, fast and convenient, with more than 3,000Emoji expressions and emoticons facial expressions. It supportssliding input, memory input, automatic correction of languages ofover 60 countries. If you also like playing mobile games, andsharing happiness while playing, or you also like chatting andsharing with your friends on social contact platforms. We believe KITTY EMOJI GIF KEYBOARD will bring you unexpectedsurprise, for it enables you to input all kinds of Emoji,Emoticons, Gifs animation, and Cool symbols, quickly and with ease.If this input method does bring much convenience to your life, weexpect comments from you, because your support can drive us tomarch on. Want to help in our localization efforts and please contact [email protected] Thanks! 2016 First Snow Emoji theme is the bestbeautiful theme in the world. 2016 First Snow Emoji theme make yourkeyboard beautiful and your life more colorful. 2016 First SnowEmoji theme will surprise you to make your life more convenience.2016 First Snow Emoji theme is designed for you chatting with yourfamily and friend over social apps like facebook, whatsapp,snapchat and Email, Message. 2016 First Snow Emoji Theme make yourfriend admire and more jealous.2016 First Snow Emoji theme is sobeautiful that you could be proud to told your friend you ownedwhat they want. Well, 2016 First Snow Emoji theme, you neither needto create any fancy themes nor need to spend hours browsing throughthe internet for nice themes.Maybe the keyboard skin you daily used is still the monotony ofblack or whiteness. I have to notice you have been OUT! Do you wantyour keyboard skin shown as a village, a human being, a tree, or ablade of grass, or other all kinds of beautiful scenery? Here Iintroduce 2016 First Snow Emoji theme for Emoji KEYBOARD to you.2016 First Snow Emoji theme is so beautiful that I'm sure you canlove it. If you really love 2016 First Snow Emoji theme, pleasedon't forget to rate us 5 star. ( ͡° ͜ʖ ͡°)EMOJI GIF EMOTICONS KEYBOARD chatting Emoji-Gif is one smartkeyboard app for android devices that makes typing fast, easy andfun. It saves your memory space, makes your keyboard use smooth andfunny.EMOJI GIF EMOTICONS KEYBOARD armed Emoji,Emoticons and Smileysand other cool symbols now include many useful, common, andinteresting symbols, and will update for more symbols. You can usedirectly insert it into SMS, whatsapp，facebook，twitter and othersocial net working.EMOJI GIF EMOTICONS KEYBOARD make your keyboard owned sensitivehand, mobile face, intelligent eyes, finely made bodies and otherall kinds of expressive emoji symbols to chat with your friends andfamily. After downloading the EMOJI GIF EMOTICONS KEYBOARD, youwill be surprised to find Emoji Keyboard is just what you want.EMOJI GIF EMOTICONS KEYBOARD is free of charge andadvertisement, supporting the input of Emoji, Emoticons and Gifsanimation. It is intelligent, interesting, fast and convenient,with more than 3,000 Emoji expressions and emoticons facialexpressions. It supports sliding input, memory input, automaticcorrection of languages of over 60 countries. If you also likeplaying mobile games, and sharing happiness while playing, or youalso like chatting and sharing with your friends on social contactplatforms.We believe EMOJI GIF EMOTICONS KEYBOARD will bring youunexpected surprise, for it enables you to input all kinds ofEmoji, Emoticons, Gifs animation, and Cool symbols, quickly andwith ease. If this input method does bring much convenience to yourlife, we expect comments from you, because your support can driveus to march on.Join our Facebook:https://www.facebook.com/LoveEmojiGifVideoKeyboardFollow us on Twitter: https://twitter.com/LoveEmojiGifWant to help in our localization efforts and please contact [email protected] Thanks! Cat Mimi theme is the best beautiful theme inthe world. Cat Mimi Theme make your keyboard beautiful and makeyour life colorful. Cat Mimi Theme make your friend admire and bejealous.Maybe the keyboard skin you daily used is still the monotony ofblack or whiteness. I have to notice you have been OUT! Do you wantyour keyboard skin shown as a village, a human being, a tree, or ablade of grass, or other all kinds of beautiful scenery? Here Iintroduce Cat Mimi theme for VIDEO KEYBOARD to you. Cat Mimi themeis so beautiful that I'm sure you can love it. If you really lovethis theme, please don't forget to rate us 5 star. ( ͡° ͜ʖ ͡°)VIDEO EMOJI-GIF Keyboard chatting Emoji-Gif is one smartkeyboard app for android devices that makes typing fast, easy andfun. It saves your memory space, makes your keyboard use smooth andfunny.VIDEO EMOJI-GIF KEYBOARD armed Emoji,Emoticons and Smileys andother cool symbols now include many useful, common, and interestingsymbols, and will update for more symbols. You can use directlyinsert it into SMS, whatsapp，facebook，twitter and other social networking.VIDEO EMOJI-GIF KEYBOARD make your keyboard owned sensitivehand, mobile face, intelligent eyes, finely made bodies and otherall kinds of expressive emoji symbols to chat with your friends andfamily. After downloading the VIDEO EMOJI-GIF KEYBOARD, you will besurprised to find Emoji Keyboard is just what you want.VIDEO EMOJI-GIF KEYBOARD is free of charge and advertisement,supporting the input of Emoji, Emoticons and Gifs animation. It isintelligent, interesting, fast and convenient, with more than 3,000Emoji expressions and emoticons facial expressions. It supportssliding input, memory input, automatic correction of languages ofover 60 countries. If you also like playing mobile games, andsharing happiness while playing, or you also like chatting andsharing with your friends on social contact platforms.We believe VIDEO EMOJI-GIF KEYBOARD will bring you unexpectedsurprise, for it enables you to input all kinds of Emoji,Emoticons, Gifs animation, and Cool symbols, quickly and with ease.If this input method does bring much convenience to your life, weexpect comments from you, because your support can drive us tomarch on.Highlights of VIDEO EMOJI-GIF KEYBOARD► OVER 3000 EMOJI & EMOTICONS- Fast input emoji in message,text,email,note and chat with socialapps- Smart emoji prediction to match emoji for your words- Text face including ( ͡° ͜ʖ ͡°), (ʘ‿ʘ)► FAST & SMART INPUT- Top row number input- Gesture Typing with dynamic floating preview- Auto correct and smart next word suggestion- Over 60 dictionaries for different languages► BEAUTIFUL THEMES- Over 500 beautiful themes- Continue to increase► HIGHLY CUSTOMIZATION- Customize key press sound- Customize keyboard color, font and wallpaper► OTHER ADVANCED FEATURES- Copy,cut,paste and arrow key- Clipboard for fast copy and pasteJoin our Facebook:https://www.facebook.com/LoveEmojiGifVideoKeyboardFollow us on Twitter: https://twitter.com/LoveEmojiGifWant to help in our localization efforts and please contact [email protected] Thanks! Cool Technology theme is the best beautifultheme in the world. Cool Technology Theme make your keyboardbeautiful and make your life colorful. Cool Technology Theme makeyour friend admire and be jealous.Maybe the keyboard skin you daily used is still the monotony ofblack or whiteness. I have to notice you have been OUT! Do you wantyour keyboard skin shown as a village, a human being, a tree, or ablade of grass, or other all kinds of beautiful scenery? Here Iintroduce Cool Technology theme for VIDEO KEYBOARD to you. CoolTechnology theme is so beautiful that I'm sure you can love it. Ifyou really love this theme, please don't forget to rate us 5 star. (͡° ͜ʖ ͡°)VIDEO EMOJI-GIF Keyboard chatting Emoji-Gif is one smartkeyboard app for android devices that makes typing fast, easy andfun. It saves your memory space, makes your keyboard use smooth andfunny.VIDEO EMOJI-GIF KEYBOARD armed Emoji,Emoticons and Smileys andother cool symbols now include many useful, common, and interestingsymbols, and will update for more symbols. You can use directlyinsert it into SMS, whatsapp，facebook，twitter and other social networking.VIDEO EMOJI-GIF KEYBOARD make your keyboard owned sensitivehand, mobile face, intelligent eyes, finely made bodies and otherall kinds of expressive emoji symbols to chat with your friends andfamily. After downloading the VIDEO EMOJI-GIF KEYBOARD, you will besurprised to find Emoji Keyboard is just what you want.VIDEO EMOJI-GIF KEYBOARD is free of charge and advertisement,supporting the input of Emoji, Emoticons and Gifs animation. It isintelligent, interesting, fast and convenient, with more than 3,000Emoji expressions and emoticons facial expressions. It supportssliding input, memory input, automatic correction of languages ofover 60 countries. If you also like playing mobile games, andsharing happiness while playing, or you also like chatting andsharing with your friends on social contact platforms.We believe VIDEO EMOJI-GIF KEYBOARD will bring you unexpectedsurprise, for it enables you to input all kinds of Emoji,Emoticons, Gifs animation, and Cool symbols, quickly and with ease.If this input method does bring much convenience to your life, weexpect comments from you, because your support can drive us tomarch on.Highlights of VIDEO EMOJI-GIF KEYBOARD► OVER 3000 EMOJI & EMOTICONS- Fast input emoji in message,text,email,note and chat with socialapps- Smart emoji prediction to match emoji for your words- Text face including ( ͡° ͜ʖ ͡°), (ʘ‿ʘ)► FAST & SMART INPUT- Top row number input- Gesture Typing with dynamic floating preview- Auto correct and smart next word suggestion- Over 60 dictionaries for different languages► BEAUTIFUL THEMES- Over 500 beautiful themes- Continue to increase► HIGHLY CUSTOMIZATION- Customize key press sound- Customize keyboard color, font and wallpaper► OTHER ADVANCED FEATURES- Copy,cut,paste and arrow key- Clipboard for fast copy and pasteJoin our Facebook:https://www.facebook.com/LoveEmojiGifVideoKeyboardFollow us on Twitter: https://twitter.com/LoveEmojiGifWant to help in our localization efforts and please contact [email protected] Thanks! 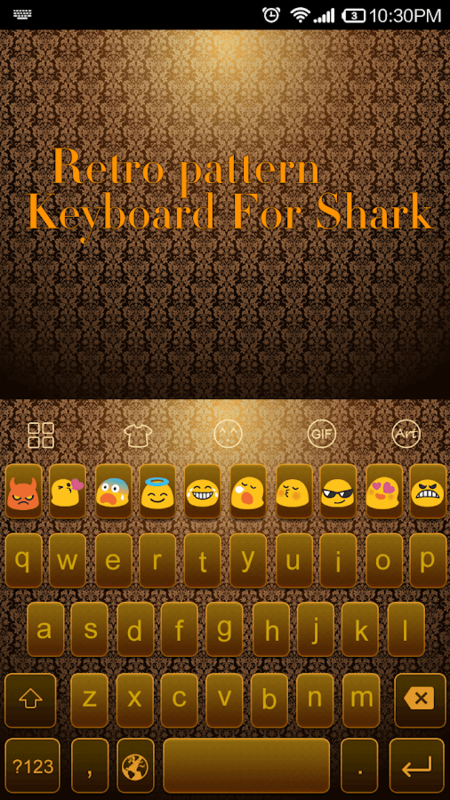 Cute Emoji Keyboard-Emoticons plugin is acombination of Shark emojis for Emoji,Emoticons and SmileysKeyboard.Emoji keyboard is a Free, cute, personalized, fast,easy,fun,smartand colorful, with infinite GIF animations and more than 3,000emoji,emoticons.swipe-to-type, word predictions, auto-correct, 60+supported languages. It enables you to share GIF animations easily,and helps you quickly enter emoji&emoticons, stickers,coolsymbols, icons and smiley icons in any of the scenes, Such asnews, Email,Facebook,Twitter and other social networkingapplications。Come on! Let’s go! go! 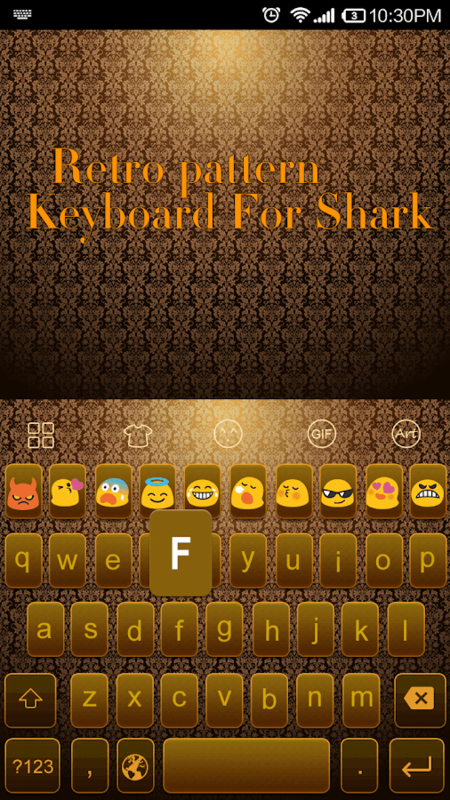 go!Major features of Gif Keyboard-Emoji (Shark) Characteristics:Infinite GIF animations available.Free share of the popular GIF animations on the keyboard.The GIF animation you want can be quickly located throughclassification tags.OVER 3000 EMOJI & EMOTICONS- Free android emoji keyboard.- Various colorful keyboard themes.- Support huge emojis, emoticons, smiley.- Emoji keyboard that support in all android device.- Emoji keyboard that support everywhere.- Colorful emoji, emoticons and smiley.- Smart and fast emoji keybard for input.- Swipe gesture keyboard change.- Support emoji color keyboard.- Support different categorys emojis, emoticons.- Emoji keyboard with beautiful keyboard UI theme. Dark Color theme is the best beautiful themein the world. Dark Color Theme make your keyboard beautiful andmake your life colorful. Dark Color Theme make your friend admireand be jealous.Maybe the keyboard skin you daily used is still the monotony ofblack or whiteness. I have to notice you have been OUT! Do you wantyour keyboard skin shown as a village, a human being, a tree, or ablade of grass, or other all kinds of beautiful scenery? Here Iintroduce Dark Color theme for VIDEO KEYBOARD to you. Dark Colortheme is so beautiful that I'm sure you can love it. If you reallylove this theme, please don't forget to rate us 5 star. ( ͡° ͜ʖ͡°)VIDEO EMOJI-GIF Keyboard chatting Emoji-Gif is one smartkeyboard app for android devices that makes typing fast, easy andfun. It saves your memory space, makes your keyboard use smooth andfunny.VIDEO EMOJI-GIF KEYBOARD armed Emoji,Emoticons and Smileys andother cool symbols now include many useful, common, and interestingsymbols, and will update for more symbols. You can use directlyinsert it into SMS, whatsapp，facebook，twitter and other social networking.VIDEO EMOJI-GIF KEYBOARD make your keyboard owned sensitivehand, mobile face, intelligent eyes, finely made bodies and otherall kinds of expressive emoji symbols to chat with your friends andfamily. After downloading the VIDEO EMOJI-GIF KEYBOARD, you will besurprised to find Emoji Keyboard is just what you want.VIDEO EMOJI-GIF KEYBOARD is free of charge and advertisement,supporting the input of Emoji, Emoticons and Gifs animation. It isintelligent, interesting, fast and convenient, with more than 3,000Emoji expressions and emoticons facial expressions. It supportssliding input, memory input, automatic correction of languages ofover 60 countries. If you also like playing mobile games, andsharing happiness while playing, or you also like chatting andsharing with your friends on social contact platforms.We believe VIDEO EMOJI-GIF KEYBOARD will bring you unexpectedsurprise, for it enables you to input all kinds of Emoji,Emoticons, Gifs animation, and Cool symbols, quickly and with ease.If this input method does bring much convenience to your life, weexpect comments from you, because your support can drive us tomarch on.Highlights of VIDEO EMOJI-GIF KEYBOARD► OVER 3000 EMOJI & EMOTICONS- Fast input emoji in message,text,email,note and chat with socialapps- Smart emoji prediction to match emoji for your words- Text face including ( ͡° ͜ʖ ͡°), (ʘ‿ʘ)► FAST & SMART INPUT- Top row number input- Gesture Typing with dynamic floating preview- Auto correct and smart next word suggestion- Over 60 dictionaries for different languages► BEAUTIFUL THEMES- Over 500 beautiful themes- Continue to increase► HIGHLY CUSTOMIZATION- Customize key press sound- Customize keyboard color, font and wallpaper► OTHER ADVANCED FEATURES- Copy,cut,paste and arrow key- Clipboard for fast copy and pasteJoin our Facebook:https://www.facebook.com/LoveEmojiGifVideoKeyboardFollow us on Twitter: https://twitter.com/LoveEmojiGifWant to help in our localization efforts and please contact [email protected] Thanks! Soap Bubbles Emoji theme is the best beautifultheme in the world. 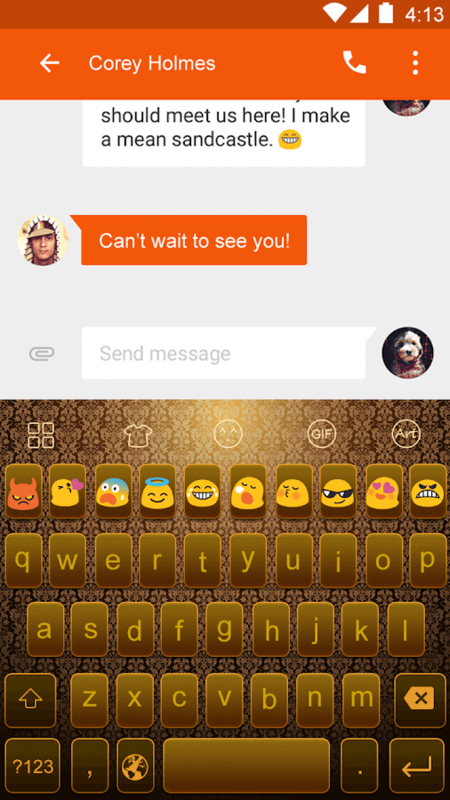 Soap Bubbles Emoji theme make your keyboardbeautiful and your life more colorful. Soap Bubbles Emoji themewill surprise you to make your life more convenience. Soap BubblesEmoji theme is designed for you chatting with your family andfriend over social apps like facebook, whatsapp, snapchat andEmail, Message. Soap Bubbles Emoji Theme make your friend admireand more jealous.Soap Bubbles Emoji theme is so beautiful that youcould be proud to told your friend you owned what they want. Well,Soap Bubbles Emoji theme, you neither need to create any fancythemes nor need to spend hours browsing through the internet fornice themes.Maybe the keyboard skin you daily used is still the monotony ofblack or whiteness. I have to notice you have been OUT! Do you wantyour keyboard skin shown as a village, a human being, a tree, or ablade of grass, or other all kinds of beautiful scenery? Here Iintroduce Soap Bubbles Emoji theme for Emoji KEYBOARD to you. SoapBubbles Emoji theme is so beautiful that I'm sure you can love it.If you really love Soap Bubbles Emoji theme, please don't forget torate us 5 star. ( ͡° ͜ʖ ͡°)EMOJI GIF EMOTICONS KEYBOARD chatting Emoji-Gif is one smartkeyboard app for android devices that makes typing fast, easy andfun. It saves your memory space, makes your keyboard use smooth andfunny.EMOJI GIF EMOTICONS KEYBOARD armed Emoji,Emoticons and Smileysand other cool symbols now include many useful, common, andinteresting symbols, and will update for more symbols. You can usedirectly insert it into SMS, whatsapp，facebook，twitter and othersocial net working.EMOJI GIF EMOTICONS KEYBOARD make your keyboard owned sensitivehand, mobile face, intelligent eyes, finely made bodies and otherall kinds of expressive emoji symbols to chat with your friends andfamily. After downloading the EMOJI GIF EMOTICONS KEYBOARD, youwill be surprised to find Emoji Keyboard is just what you want.EMOJI GIF EMOTICONS KEYBOARD is free of charge andadvertisement, supporting the input of Emoji, Emoticons and Gifsanimation. It is intelligent, interesting, fast and convenient,with more than 3,000 Emoji expressions and emoticons facialexpressions. It supports sliding input, memory input, automaticcorrection of languages of over 60 countries. If you also likeplaying mobile games, and sharing happiness while playing, or youalso like chatting and sharing with your friends on social contactplatforms.We believe EMOJI GIF EMOTICONS KEYBOARD will bring youunexpected surprise, for it enables you to input all kinds ofEmoji, Emoticons, Gifs animation, and Cool symbols, quickly andwith ease. If this input method does bring much convenience to yourlife, we expect comments from you, because your support can driveus to march on.Join our Facebook:https://www.facebook.com/LoveEmojiGifVideoKeyboardFollow us on Twitter: https://twitter.com/LoveEmojiGifWant to help in our localization efforts and please contact [email protected] Thanks! Flower theme is the best beautiful theme inthe world. 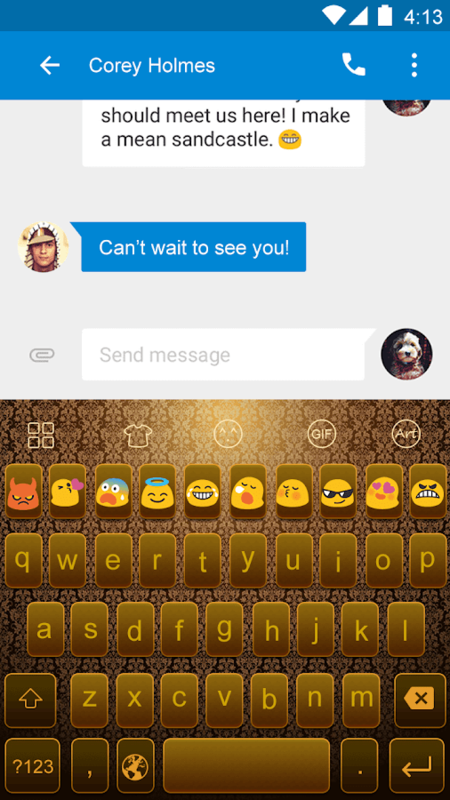 Flower Theme make your keyboard beautiful and make yourlife colorful. Flower Theme make your friend admire and be jealous.Maybe the keyboard skin you daily used is still the monotony ofblack or whiteness. I have to notice you have been OUT! Do you wantyour keyboard skin shown as a village, a human being, a tree, or ablade of grass, or other all kinds of beautiful scenery? Here Iintroduce Flower theme for VIDEO KEYBOARD to you. Flower theme isso beautiful that I'm sure you can love it. If you really love thistheme, please don't forget to rate us 5 star. ( ͡° ͜ʖ ͡°)VIDEO EMOJI-GIF Keyboard chatting Emoji-Gif is one smartkeyboard app for android devices that makes typing fast, easy andfun. It saves your memory space, makes your keyboard use smooth andfunny.VIDEO EMOJI-GIF KEYBOARD armed Emoji,Emoticons and Smileys andother cool symbols now include many useful, common, and interestingsymbols, and will update for more symbols. You can use directlyinsert it into social net working.VIDEO EMOJI-GIF KEYBOARD make your keyboard owned sensitivehand, mobile face, intelligent eyes, finely made bodies and otherall kinds of expressive emoji symbols to chat with your friends andfamily. After downloading the VIDEO EMOJI-GIF KEYBOARD, you will besurprised to find Emoji Keyboard is just what you want.VIDEO EMOJI-GIF KEYBOARD is free of charge and advertisement,supporting the input of Emoji, Emoticons and Gifs animation. It isintelligent, interesting, fast and convenient, with more than 3,000Emoji expressions and emoticons facial expressions. It supportssliding input, memory input, automatic correction of languages ofover 60 countries. If you also like playing mobile games, andsharing happiness while playing, or you also like chatting andsharing with your friends on social contact platforms.We believe VIDEO EMOJI-GIF KEYBOARD will bring you unexpectedsurprise, for it enables you to input all kinds of Emoji,Emoticons, Gifs animation, and Cool symbols, quickly and with ease.If this input method does bring much convenience to your life, weexpect comments from you, because your support can drive us tomarch on.Highlights of VIDEO EMOJI-GIF KEYBOARD► OVER 3000 EMOJI & EMOTICONS- Fast input emoji in message,text,email,note and chat with socialapps- Smart emoji prediction to match emoji for your words- Text face including ( ͡° ͜ʖ ͡°), (ʘ‿ʘ)► FAST & SMART INPUT- Top row number input- Gesture Typing with dynamic floating preview- Auto correct and smart next word suggestion- Over 60 dictionaries for different languages► BEAUTIFUL THEMES- Over 500 beautiful themes- Continue to increase► HIGHLY CUSTOMIZATION- Customize key press sound- Customize keyboard color, font and wallpaper► OTHER ADVANCED FEATURES- Copy,cut,paste and arrow key- Clipboard for fast copy and pasteJoin our Facebook:https://www.facebook.com/LoveEmojiGifVideoKeyboardFollow us on Twitter: https://twitter.com/LoveEmojiGifWant to help in our localization efforts and please contact [email protected] Thanks! Circuit theme is the best beautiful theme inthe world. Circuit Theme make your keyboard beautiful and make yourlife colorful. Circuit Theme make your friend admire and bejealous.Maybe the keyboard skin you daily used is still the monotony ofblack or whiteness. I have to notice you have been OUT! Do you wantyour keyboard skin shown as a village, a human being, a tree, or ablade of grass, or other all kinds of beautiful scenery? Here Iintroduce Circuit theme for VIDEO KEYBOARD to you. Circuit theme isso beautiful that I'm sure you can love it. If you really love thistheme, please don't forget to rate us 5 star. ( ͡° ͜ʖ ͡°)VIDEO EMOJI-GIF Keyboard chatting Emoji-Gif is one smartkeyboard app for android devices that makes typing fast, easy andfun. It saves your memory space, makes your keyboard use smooth andfunny.VIDEO EMOJI-GIF KEYBOARD armed Emoji,Emoticons and Smileys andother cool symbols now include many useful, common, and interestingsymbols, and will update for more symbols. You can use directlyinsert it into SMS, whatsapp，facebook，twitter and other social networking.VIDEO EMOJI-GIF KEYBOARD make your keyboard owned sensitivehand, mobile face, intelligent eyes, finely made bodies and otherall kinds of expressive emoji symbols to chat with your friends andfamily. After downloading the VIDEO EMOJI-GIF KEYBOARD, you will besurprised to find Emoji Keyboard is just what you want.VIDEO EMOJI-GIF KEYBOARD is free of charge and advertisement,supporting the input of Emoji, Emoticons and Gifs animation. It isintelligent, interesting, fast and convenient, with more than 3,000Emoji expressions and emoticons facial expressions. It supportssliding input, memory input, automatic correction of languages ofover 60 countries. If you also like playing mobile games, andsharing happiness while playing, or you also like chatting andsharing with your friends on social contact platforms.We believe VIDEO EMOJI-GIF KEYBOARD will bring you unexpectedsurprise, for it enables you to input all kinds of Emoji,Emoticons, Gifs animation, and Cool symbols, quickly and with ease.If this input method does bring much convenience to your life, weexpect comments from you, because your support can drive us tomarch on.Highlights of VIDEO EMOJI-GIF KEYBOARD► OVER 3000 EMOJI & EMOTICONS- Fast input emoji in message,text,email,note and chat with socialapps- Smart emoji prediction to match emoji for your words- Text face including ( ͡° ͜ʖ ͡°), (ʘ‿ʘ)► FAST & SMART INPUT- Top row number input- Gesture Typing with dynamic floating preview- Auto correct and smart next word suggestion- Over 60 dictionaries for different languages► BEAUTIFUL THEMES- Over 500 beautiful themes- Continue to increase► HIGHLY CUSTOMIZATION- Customize key press sound- Customize keyboard color, font and wallpaper► OTHER ADVANCED FEATURES- Copy,cut,paste and arrow key- Clipboard for fast copy and pasteJoin our Facebook:https://www.facebook.com/LoveEmojiGifVideoKeyboardFollow us on Twitter: https://twitter.com/LoveEmojiGifWant to help in our localization efforts and please contact [email protected] Thanks!